More than 8.7 million Americans reported for military duty in Southeast Asia, but only a select few wore the Green Beret, the distinctive symbol of the U.S. Army Special Forces. Operating out of small outposts in some of the worlds most rugged terrain, these elite soldiers played a crucial role during the protracted conflict. 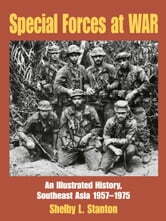 Special Forces at War: an Illustrated History, Southeast Asia 1957-1975 by wartime veteran and military historian Shelby l. Stanton comprises ten chapters, chronologically arranged, that show Special Forces' activity from the first deployments of Green Berets into battle, through their ever-expanding instruction and training, wartime advisory, border surveillance, strike force, and special operations roles. No matter what the task, the Special Forces served with valor and dedication. This photographic history is unprecedented in scope. 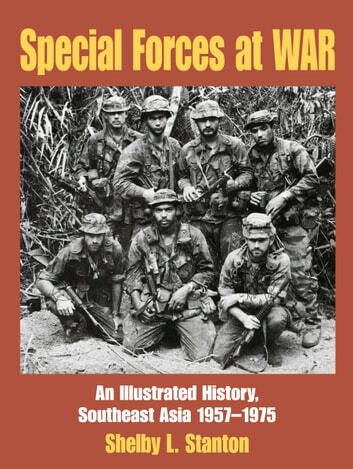 Featuring rare and unpublished images, it presents an exclusive, insider view of covert activities such as Project Delta, whose Special Forces-trained Vietnamese commandos, nicknamed "road-runners," posed as North Vietnamese Army or Viet Cong troops behind communist lines. It depicts Special Forces' camps before, during, and after enemy assaults. It features an array of lethal weapons used by resourceful Green Berets fighting to preserve their remote outposts, as well as allied and enemy documents and propaganda. From ordinary camp life to special missions, no aspect of Special Forces activities during the Second Indochina War has been overlooked. Stanton knows his subject first hand. During six years of active duty as an infantry officer in the U.S. Army, he served as a paratrooper platoon leader, an airborne ranger advisor to the Royal Thai Army Special Warfare Center, and a Special Forces long-range reconnaissance team commander in Southeast Asia before being wounded in combat in Nam Yu, LaosThrough his contacts with Special Forces veterans and his own research, Stanton has assembled hundreds of photographs, details.